New and Refreshing! 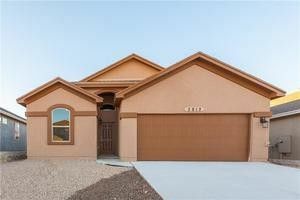 This single story four bedroom home is one to see. Very open floor plan with great room opening to kitchen and dining area. The master is a good size and master bath offers separate shower and tub. Be pleasantly surprised at the size of the other three bedrooms. There is two baths and a laundry room as well as black appliances and faux wood blinds. Come see all the great touches this home has I am sure you will fall in love with D R Horton homes. Come by today and one of our great homes!